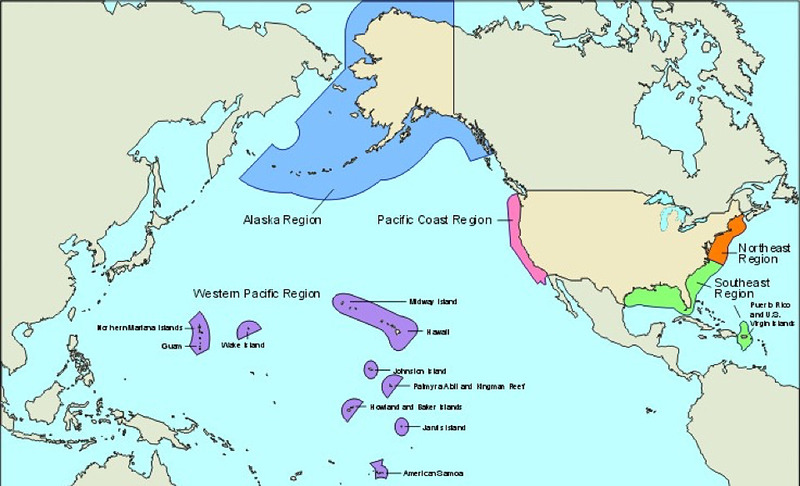 Exclusive economic zone of the United States (image credit: NOAA). An Exclusive Economic Zone (EEZ), as defined by the United Nations Convention on the Law of the Sea, is a 200 nautical mile jurisdiction granted to coastal nations for “sovereign rights for the purpose of exploring and exploiting, conserving and managing the natural resources, whether living or non-living, of the waters superjacent to the seabed and of the seabed and its subsoil, and with regard to other activities for the economic exploitation and exploration of the zone.” Within an EEZ, a country claims exclusive rights to manage fisheries and prevent overfishing. While the outer 200 mile boundary determines a country’s sovereign limits, within the U.S., most coastal states claim an inner three nautical mile zone from the shore as state waters (some places claim nine nautical miles). 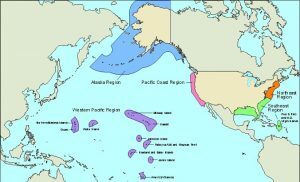 For fisheries, such as defined under the Magnuson-Stevens Fishery Conservation and Management Act, management in the inner zone belongs to the states and the remainder of the EEZ is under purview of the federal government (e.g., the National Oceanic and Atmospheric Administration). 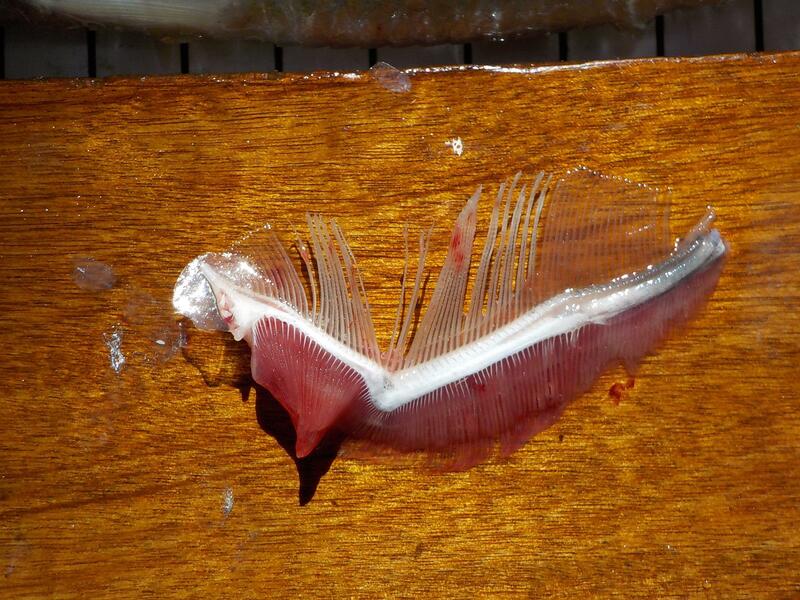 Gill rakers (above gill arch) from an American Shad Alosa sapidissima are not to be confused with gill filaments (below); they are particularly important for filter-feeding fish (photo credit: NOAA). While gill rakers have no role in gas exchange, the predominant function of gills, they do perform an equally important function for filter-feeding fish – food acquisition. These bony projections serve as a sieve to trap food particles. They vary greatly in length and number and these characteristic differences have evolved with different feeding strategies for fish. A plankton feeder, for example, such as American Shad Alosa sapidissima, has very tightly-packed, comb-like, gill rakers to efficiently filter their food from the water column. An omnivore or piscivore, on the other hand, has shorter, more widely-spaced gill rakers, better for larger prey items. In fact, the morphology of gill rakers is so diverse that they are often used as a taxonomic tool to identify and classify fish species (e.g., gill raker counts can differentiate species on a dichotomous key). This spawned out Chinook Salmon contributes to the escapement estimate for its particular run. Escapement is a term used in salmon management to mean, quite simply, how many salmon are able to “escape” premature death and complete their full life cycle. These escapees have run the gauntlet of natural mortality, recreational fishing, commercial fishing, and other life-threatening episodes for the opportunity to spawn in freshwater. 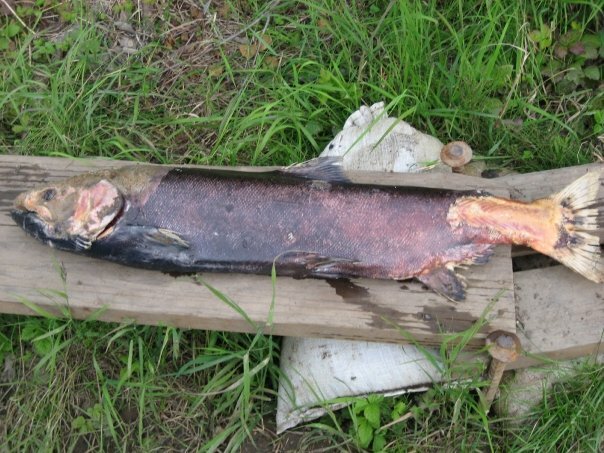 Escapement is estimated by a number of different methods including fish counts (e.g., at a weir or dam viewing window) and carcass surveys (i.e., counting the dead salmon on spawning grounds). 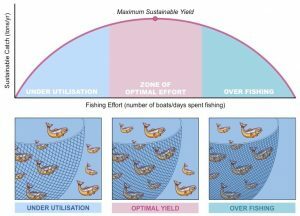 For salmon managers, the amount of escapement for each salmon run informs population estimates and appropriate fishing quotas and other management strategies for future fishing seasons. The underside of a Walleye’s gills (photo credit: USFWS). 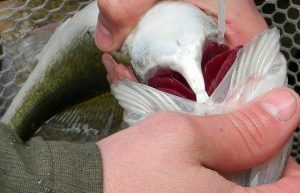 No matter if a fish is sick or not, fish gills are often red – blood red, to be exact. That is because gills have blood vessels very close to their external surface. As the primary mode of gas exchange for most fish (but not all! ), gills absorb oxygen from water that passes over them and release carbon dioxide usually facilitated through a counter-current exchange of blood and water flowing in opposite directions. Gill lamellae provide increased surface area for gas exchange, which is particularly important because there is less dissolved oxygen in water than there is in air. For fish that breathe air, lungs and skin provide alternative methods for oxygen absorption. 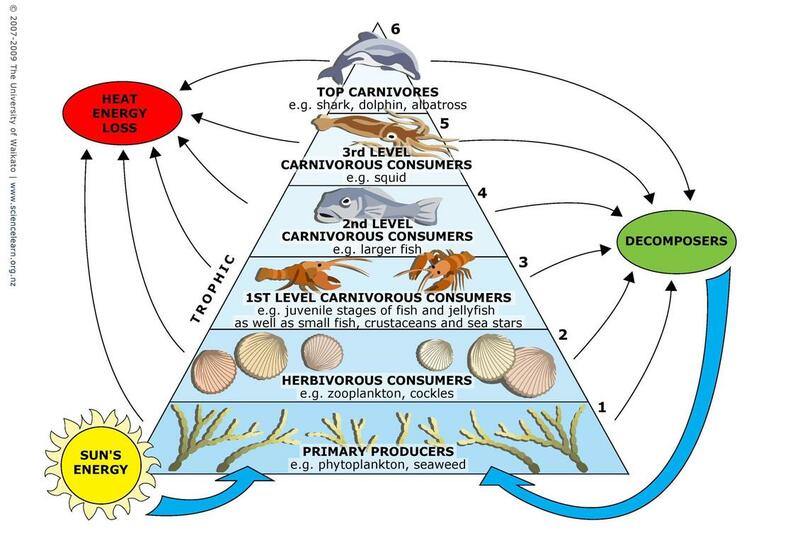 Marine trophic levels (diagram credit: University of Waikato). 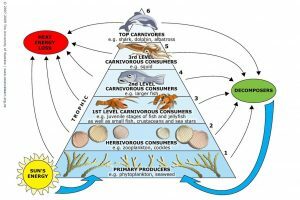 Trophic levels are a defined by the position of organisms in a food chain or food web. The different levels help define the flow of energy within an ecosystem. The lowest trophic level is primary producers, such as algae and phytoplankton, which generate their own energy from the sun via photosynthesis. Primary consumers, such as herbivorous zooplankton, must eat primary producers as their source of energy. 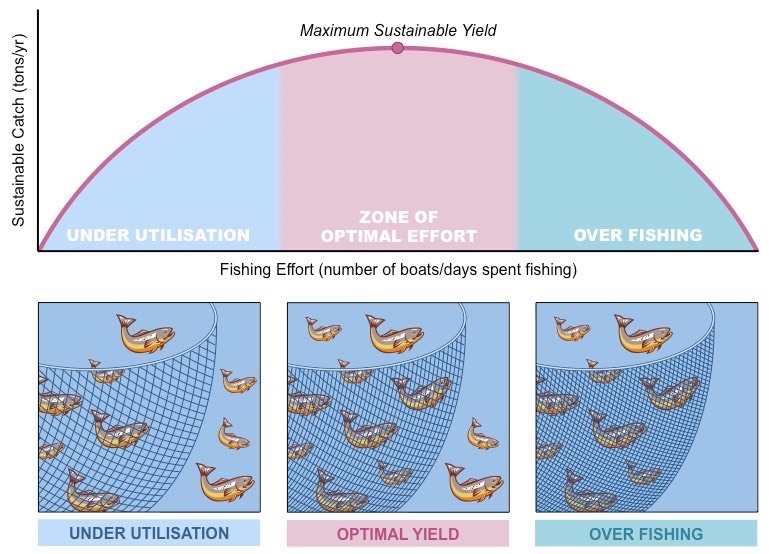 As a general rule, each trophic level up equates to capturing 10% of the energy from the trophic level below it (e.g., a juvenile fish uses 10% of the energy it gets from eating zooplankton and only 1% of the energy the zooplankton gets from eating phytoplankton). Many food webs contain organisms, such as fish that eat other fish and zooplankton, that do not fall into simple trophic level constructs. Stable isotope analyses can be used to infer diet and trophic level for these complex diets by comparing isotopic signatures in tissue from the organisms of interest to those from samples of known origin. Commonly used isotopes for aquatic ecosystem food web analyses include 13C, 15N and 34S. “I think you have a dead fish,” said a concerned aquarium visitor who summoned me to a nearby tank. Pointing to the tank the visitor recounted that they had been watching for a while and had not seen the fish move from it’s position on the bottom. The fish, I am happy to report, was not dead, but alive and well. The visitor had spotted a halibut! Halibut are flatfishes (this group also includes flounder, sole, turbot, and plaice), they begin their lives as bilaterally symmetrical larvae swimming in the water column, but eventually metamorphose over the course of a few days into a laterally compressed, pancake-like bottom dweller (and a successful sit-and-wait predator). When you think of species that metamorphose (a change in body form between life stages), fish may not be the first type of organism that comes to mind. You probably think of caterpillars and butterflies or tadpoles and frogs, but there are actually over 500 species of fish that metamorphose! 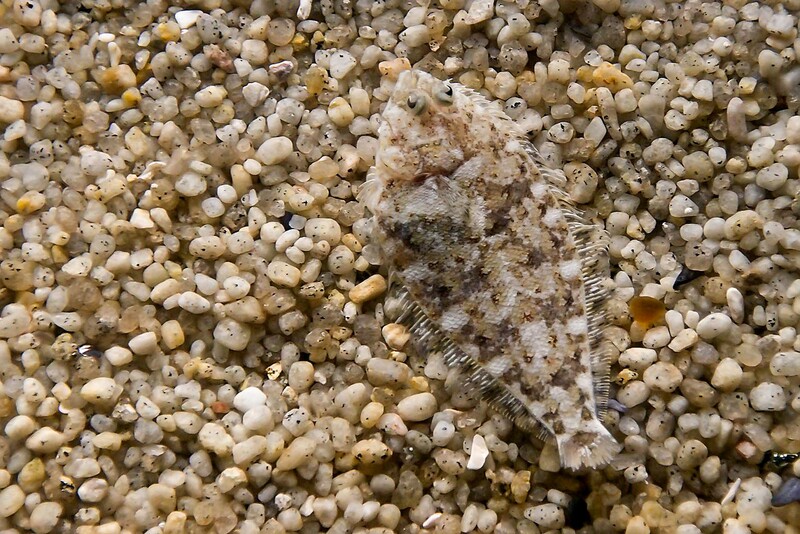 A flounder camouflaging with the bottom (photo credit: Moondigger via Wikimedia Commons [CC BY-SA 2.5]). One of the most distinct changes that takes place during flatfish metamorphosis is the movement of one eye to the other side of the body, so both eyes are on the same side. This requires reorganization of the bones and muscles in the head of the fish and also impacts the brain and the olfactory system. Additionally, the fish will begin swimming on its side and the coloration on the top side of the body (where both eyes are) will also begin to change helping the fish camouflage with its benthic environment. All these changes are controlled in some way by the thyroid hormone, but there is still a considerable amount to learn about these mechanisms and the evolutionary benefits of these changes. Each year adult salmon migrate upstream to spawn (lay eggs) putting into motion their offsprings’ journey from hatching to making their way back to the ocean as juveniles. In addition to being a spectacular event to witness, these migrations also play a central role in ecosystem health. Over 100 different species benefit from the nutrients that the salmon provide! 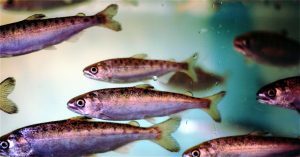 In order for a juvenile salmon to successfully complete their journey to the ocean and continue providing benefits to marine and freshwater ecosystems when they return to as adults, the juveniles must undergo a series of changes through a process called smoltification. Coho salmon are one of many salmon species, their smolt lifestage is pictured here. Smoltification occurs in anadromous species prior to entering saltwater. For example, as salmon juveniles move from their freshwater nursery habitats to the ocean, they transition from what scientists call parr to a smolt lifestage. During this transition, they change color, losing their parr bars (dark, vertical bars) and defined countershading, making them appear silvery. Their bodies also change to be more streamlined and buoyant. Even their attitudes change! While parr are typically highly territorial in shallow water, this aggression declines as the smolts move into deeper water and form shoals (large groups). During smoltification salmon smolts get a good whiff of the water to imprint on the odor of their natal stream (stream where they were born) in order to identify it during their return spawning migration as adults. Finally, how the salmon breathe (take oxygen out of the water with their gills) also changes as they go from freshwater to saltwater. Smoltification does not begin at a specific time in all salmon species, but varies depending on temperature, latitude, size, rate of growth, age, and feeding opportunities or a combination of these factors. 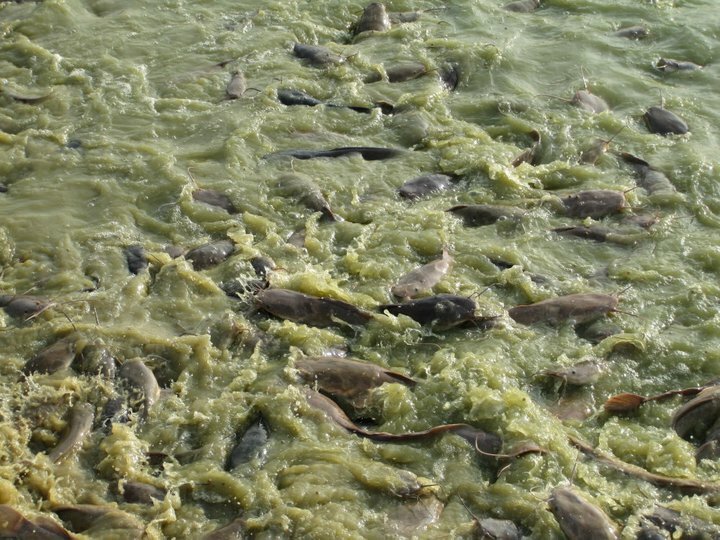 Since the changes that take place during smoltification are not necessarily beneficial for remaining in freshwater, the changes will reverse (desmoltification) for fish who are unable to migrate to saltwater. This is sometimes the case when there is a barrier to migration, which can cause fish to remain in freshwater throughout their lifecycle. Luckily for these individuals, salmon are equipped to survive in freshwater as long as they need to, but the inability to migrate will limit their ability to provide important nutrients to these freshwater ecosystems on their return migration as adults. How many species of salmon can you name? Countershading, originally described in the late 1800s, is when one side of an animal is dark and the other is light, serving as a form of camouflage. In fish, such as the Atlantic Bluefin Tuna (Thunnus thynnus) pictured, this typically means the ventral side (bottom) is light and the dorsal side (top) is dark. This is useful for fish because the dark dorsal side helps them blend in the with substrate or deeper water below if they are being viewed from above. Then, the lighter dorsal side helps fish blend in with the water (and light backdrop of the sky) above them if you are looking at the from below. Countershading is seen in fish species in coastal and open ocean habitats. 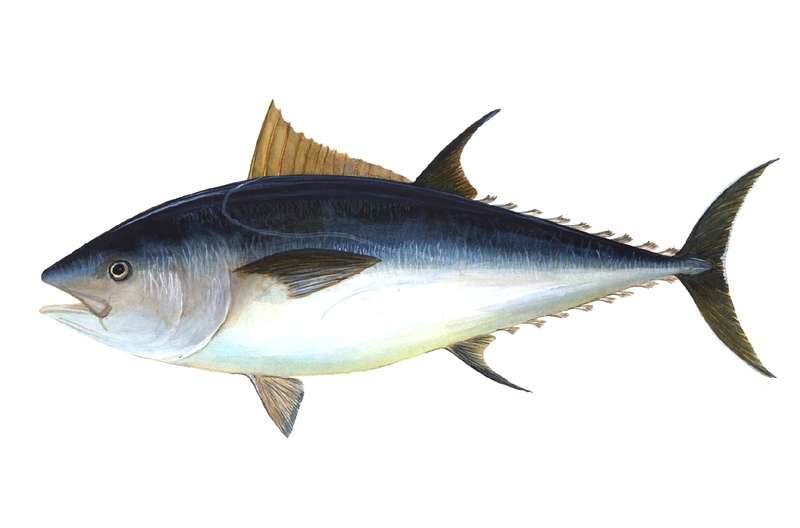 Atlantic Bluefin Tuna are one of many pelagic species that exhibit countershading. However, some species, such as the Nile catfish (Synodontis batensoda), exhibit reverse countershading where the ventral side is dark and the dorsal side is light. The Nile catfish feeds while swimming upside down in the water column and the reverse countershading helps it camouflage. While evidence of the mechanisms that drive countershading are lacking, studies suggest that there is an adaptive advantage to countershading in aquatic habitats where the scattering of light through the water column remains relatively uniform throughout the day compared to terrestrial environments (Ruxton et al. 2004). Can you think of other animals that exhibit countershading? Ruxton, Graeme D., Michael P. Speed, David J. Kelly, What, if anything, is the adaptive function of countershading?, Animal Behaviour, Volume 68, Issue 3, September 2004, Pages 445-451, ISSN 0003-3472, http://dx.doi.org/10.1016/j.anbehav.2003.12.009.